Sterling Ridge Resort, is a Vermont, family-owned log cabin resort known for its hospitality and unique Vermont experience. 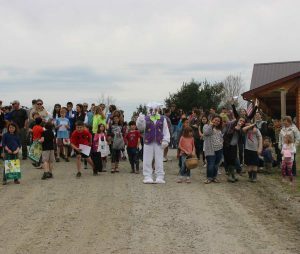 Jeffersonville, VT —Sterling Ridge Resort is once again hosting their Annual Easter Egg Hunt for the local community and its guests. This year, it will be Saturday, April 20 at 10 am, and everyone is welcome to attend! Admission is free, but Sterling Ridge encourages attendees to bring a non-perishable food item for the local Jeffersonville Food Shelf. Come celebrate spring with fun gifts, candy, and lots of other surprises. Egg hunters can explore the resort’s trails to look for eggs and possibly to find one of the few ‘golden eggs’ that are filled with special prizes. 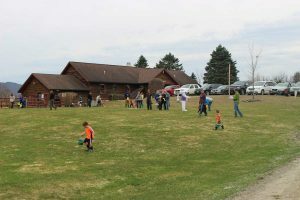 Once again, Sterling Ridge will offer an “Under 5 Field” for the younger egg seekers. Founded in 1989 and transformed into Sterling Ridge Resort in 1995. Sterling Ridge is a log cabin resort situated on 362 acres down a scenic back road in Northern Vermont. The resort consists of 24 secluded cabins and 2 other larger units. This four-season lodging establishment is a perfect choice for getaways, family vacations, reunions, and weddings. Visit sterlingridgeresort.com for more information.